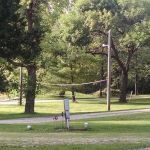 Ask fellow campers about "Jonesburg Gardens Campground" and nearby attractions. My husband and I were having issues with our alternator so we had to stop. This was the closest campground to us. If you have ever seen the movie Deliverance, this is the feeling and atmosphere at this park. Old RV's, broken down trucks, pond full of scum. The playground had broken equipment and it was all very old. The site for the camper was level and the pool was fairly clean but these were the only good things about this campground. The showers and bathrooms were old and smelled horrible. There were some shady looking folks hanging around that really gave me the creeps. We charged our batteries and left after 2 hrs. The man who checked us in saw us leaving and just turned his head. There were only 3 other campers there and 2 of them belonged to the owner's family. Really creepy place! We camped at Jonesburg Gardens Campground in a Motorhome. Very nice couple owns it. Very level lot I was in. Very shady which is great in summer. Made you feel like you were really camping in the woods-loved it. Has a fishing pond and a fenced playground area for kids. He has goats, chickens and geese on the property. Really fresh eggs for breakfast. Country setting, close to freeway-noise not to bad. Very nice older campground. I broke down on freeway and was towed here. I'm glad I was. I will definitely be back. You ought to check it out. We camped at Jonesburg Gardens Campground in a Travel Trailer. Prior reviews of this park amuse me. It is either rated very high or 1/2 star! Different strokes for different folks. Once we were in our site, it was very level and not bad. We were only here for one night. This is really a nice place however, you do have to over look the junk, semi truck trailers, old campers, etc., but it isn't the worse place we have stayed. You couldn't ask for nicer owners and I felt for them, but this place needs a good going over. Just removal of a few things would even help. And what is with the word Gardens in the park name? Sure weren't any there. We camped at Jonesburg Gardens Campground in a Motorhome. New to TT camping but this place reminded me of real camping! Nice grassy spots, good shade. Playground for the kiddos & sleeping cabins for extended family or those who don't have a trailer or tent. Owners were personable! Hope to be able to go back again. We camped at Jonesburg Gardens Campground in a Travel Trailer. While the owner was nice, he is fighting a losing battle against time and deterioration. I have no idea how this park can have as high a rating as it does...maybe it was nice 20 years ago, but now it is only a 50 year old park with junk cars, abandoned RVs, a scummy green pond and moss covered paddleboats that were apparently for rent. The roads are narrow and lined with trees that scratch RVs. The water system leaks so bad that several sites are only mud bogs, and the sites are so out of level that we could not get the motorhome properly set up. The office smells like the cigarette smoke, hasn't been aired out in years. Never, never, never again!! We camped at Jonesburg Gardens Campground in a Motorhome. This campground has lots of potential but needs lots of TLC. Old trucks & other junk litter the entire campground, grass is overgrown and there is 2 ponds that smell bad. Lots of trees and spaces are large enough if there were some general groundskeeping done on a regular basis. Needs lots of work. They had a pool but was leary of getting into the water. We camped at Jonesburg Gardens Campground in a Travel Trailer. Right off I 70 but nothing else around for shopping besides their store. Not much available for shopping. This is an old park, rundown and overgrown. We were just using this as a place to rest for the night. We were able to make it to the site ok, but really was worried about the amount of limbs and growth in the roadway. Would not want to be driving a shiny new rig through. Cost was very high for what you get. Going 20 miles down the road would have yielded better place to stay. We would not stay here again. We camped at Jonesburg Gardens Campground in a Motorhome. Price is including tax & Good Sam's discount. Not a bad campground, we were just going to be here overnight. From what we saw, all campsites were pull throughs, or at least most of them. Gravel roads & sites, our site was level enough that I didn't have to unhook. The campground could use some TLC, and the fishing ponds are pretty mossy, doubt if there would be very good fishing. Easy on & off from I-70, and not far off the interstate. We camped at Jonesburg Gardens Campground in a Fifth Wheel. Pros: Staff was friendly and accommodating. Small Mom and Pop type operation. Site was gravel and long enough for our rig and tow. FHU worked fine. Some highway noise but not bothersome. Cons: Office was filthy and cluttered. Grounds were cluttered with old vehicles parked in abandoned sites along the perimeter of the campground. Trash containers overflowing. Trees and shrubs untrimmed although staff was working on trimming one area of the property while we were there. Our fire pit had trash in it from previous campers. Cabins looked like they hadn't been touched in months. Pond was green. We would not stay here again. We camped in a motorhome. We camped at Jonesburg Gardens Campground in a Motorhome. I find this to be a little gem of a park, but bear in mind that I came during off season, so it is practically empty and appears to be extremely spacious (it's hard to tell how close other trailers would be, but there does appear to be enough space between sites). The roads within the campground are a little narrow, but we were still able to navigate them, and the wifi has much to be desired. Otherwise I find this place to be very serene. Obviously, the pool is closed for the season, but it looks to be a nice area. There's a nice playground for the kiddies (DH and I even swung on the swings!) and 2 little lakes where you can fish without a license. Allegedly there's bass and some other stuff stocked there, but I wasn't able to try). The owner was very nice and helpful. I would definitely come back again. 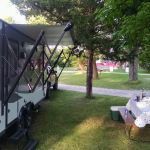 We camped at Jonesburg Gardens Campground in a Fifth Wheel. Not a whole lot to do in the area, but a nice place to stay overnight or if you're just looking for a quiet place to escape to. Sites are gravel or grass. The trees limbs need to be trimmed really bad to prevent damage to sides of coach. The owner did not seem to be concerned. 50/30 amp service with water and sewer. The sign identifying the park location on the perimeter road was hanging down so we missed the turn and had to get back on interstate and return to the proper exit. We camped at Jonesburg Gardens Campground in a Motorhome. The Budweiser ranch "Warm Springs" was a great day trip. Clydesdale Horses. Herman MO was also good. Wineries and great German food. It isn't a bad place and we'd stay again. 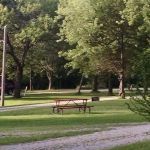 Price is ridiculous: charging KOA rates for a run down campground. The good: it is quiet; safe; good utilities; convenient to the Interstate; owners are nice. The bad: price; price; no WiFi. It would not take much to spruce up the place and make it more presentable. We camped at Jonesburg Gardens Campground in a Motorhome. We enjoyed our overnight stay at this park. It was quiet, shaded and a nice change of pace. We had read such negative reviews and almost didn't stay but decided to take those reviews with a grain of salt. Glad we did. The price was a little high and the grounds could use a mow. We found the goats charming and only saw one cat. The pool was clean and grounds were clean. There are a few older campers but all located on the same side of the park. I felt safe and relaxed here. I would definitely stay again. We camped at Jonesburg Gardens Campground in a Motorhome. 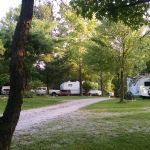 Are you affiliated with Jonesburg Gardens Campground ?